At what point does eating chocolate cake transform from an enjoyable experience to a nightmare? At what point does binge watching Netflix ruin your day? At what point does the number of municipalities go from providing value to destroying it? Basic economics, basic psychology—basic, common sense teaches us too much of a good thing is a bad thing. Whether you view government as the scourge of society or greatest promoter of the common welfare, a limit does exist when it comes to the value multiple municipalities provide. 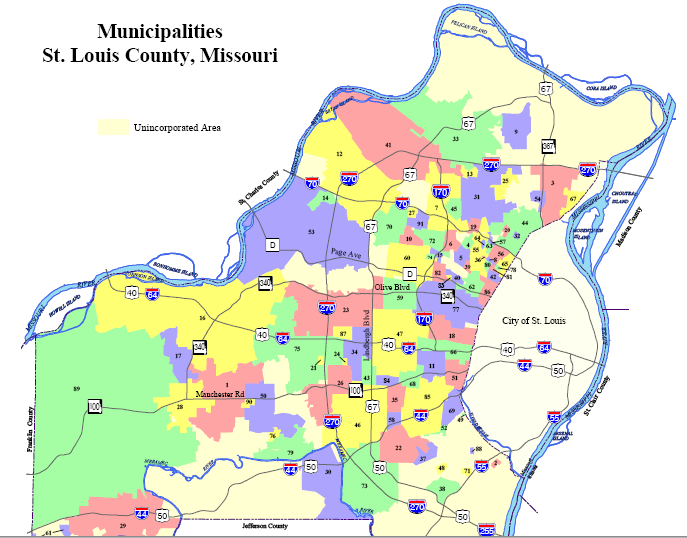 Municipalities race to bottom against each other. Instead of perceiving ourselves as one St. Louis heading in the same unified direction, we bicker over sales taxes and compete for fancy sports complexes. All the while, social strife damages local lives and our national reputation, money goes wasted on redundant services, and businesses look to our neighbors due the fragmentation of our policies. Each municipality the added diminishes the return in value to our region. Enough is enough. It is time to bring the region closer together in order to build a stronger future for our economy.